Has the Trump administration repealed 22 regulations for each new one? One of the Trump administration’s favorite talking points has been that the president has repealed more federal regulations than any president in history. Another favorite is that the president has repealed 22 federal regulations for every new regulation placed on the books. This supposedly exceeds a campaign promise to repeal two regulations for every one implemented. 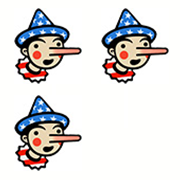 But, as we have reported before, the claim of eliminating more regulations than any previous president simply cannot be verified, as there is not enough data to support this statement. There is data that indicates that growth in regulations has slowed significantly under President Trump, but that’s apparently not a good-enough story to tell, from the administration’s perspective. Meanwhile, this 22-to-1 claim was debunked by experts after Trump announced it last December, yet the administration refuses to drop it. Let’s explore. In Trump’s “Contract With the American Voter,” issued Oct. 22, 2016, he pledged that for every federal regulation, two existing regulations must be eliminated. Shortly after taking office, the president signed an executive order that aimed to put this policy into effect. The order also said that the cost of any new regulation should be offset by eliminating regulations with the same costs to businesses. In December, with great fanfare, the president announced that he had done even better than planned, eliminating 22 regulations for every one enacted in fiscal 2017. But when experts started studying the list of 67 “deregulatory” actions, they found that the figures were pretty dubious. As documented by Bloomberg News, the listed actions include ones initiated by previous presidents, double counting and relatively inconsequential steps. One action listed as deregulatory, having to do with immigration, imposed new burdens on businesses participating in an expanded visa program. At least 22 of the 67 claimed actions were started under President Barack Obama, Bloomberg News found. Cary Coglianese, a professor at the University of Pennsylvania, faulted the list for including many deregulatory actions that were relatively minor, compared with the more substantial regulatory actions. “It is not too much of an exaggeration to say that administration officials are removing 22 ‘Peter Rabbit’ books from the regulators’ shelves for every one ‘War and Peace’ they add,” he wrote. The odd thing about this apple-polishing is that the administration might have been able to make its case without resorting to fuzzy math. Clyde Wayne Crews of the Competitive Enterprise Institute crunched the numbers and concluded that after Trump’s first year, the administration had taken 62 deregulatory actions and 15 regulatory actions, for a ratio of 4 to 1. In a recent update, accounting for information contained in the Office of Management and Budget’s spring agenda, Crews updated the list to a total of 149 deregulatory actions to 29 regulatory actions, for a ratio of nearly 5 to 1. Here’s the rub: Virtually all of these steps are not considered “economically significant,” meaning it would have an annual impact of $100 million or more. That’s an important caveat, Crews said. Under the administration’s regulatory agenda, the OMB website shows 498 pending actions are listed as deregulatory and 133 as regulatory, as defined by the executive order. That’s a ratio of nearly 4 to 1. The major actions going forward include efforts such as freezing fuel-efficiency requirements for the nation’s cars and trucks through 2026. That’s certainly a huge rollback of regulations, though it will face significant court challenges. But the minor deregulatory actions include such items as allowing the importation of fresh pomelo fruit from Thailand and pine shoot beetle deregulation. Susan E. Dudley, director of the Regulatory Studies Center at George Washington University and a former administrator of OMB’s Office of Information and Regulatory Affairs during the George W. Bush administration, said the White House appeared to be straining to achieve what was just campaign rhetoric. Bridget C.E. Dooling, a research professor with the GW Regulatory Studies Center and a former OMB official, in a report published Aug. 1 found that significant regulatory activity declined dramatically — by 70 percent and 66 percent — during the Trump administration’s first 18 months, compared with the same period in the Obama and Bush administrations, respectively. So under this metric, regulatory restrictions have increased under Trump but at a dramatically slower pace. “President Trump’s first year in office really was different from the first year of his predecessors — by a long shot,” McLaughlin wrote. The administration defended the continued use of the 22-to-1 figure, saying the spring update was only an interim step, with a full report coming out in mid-October, after the fiscal year ends. The administration has also touted the claim that in fiscal 2017, agencies saved more than $8 billion in present-value regulatory costs, or $570 million a year. But this is not the same as the rules listed in the 22-to-1 ratio. More than half of the total comes from the repeal of a federal acquisition rule that lawmakers pushed through Congress early in the Trump administration. There is little doubt that Trump is leading an attack on the regulatory state. For conservatives, that is a good news story. But the administration continues to oversell its achievements with hyped statistics. There’s really no need to gild the lily like this. The 22-to-1 figure is especially not credible, as even analysts sympathetic to the administration’s mission have said it is overstated. It should be dropped as a talking point even before the fiscal year is completed. Given what the current regulatory agenda looks like, there is little prospect to sustain that pace, unless the accounting gets even fishier. “This President has actually repealed 22 federal regulations for every new federal rule put on the books."